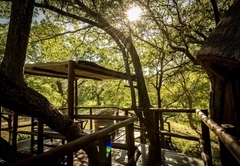 Pezulu Tree House Lodge is a highly recommended Limpopo game lodge providing a wildlife experience for discerning tourists visiting Valley of the Olifants. 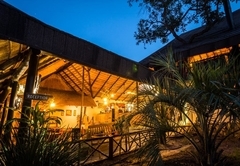 Pezulu is a small, exclusive Tree House Game Lodge situated in the game rich area of the Limpopo Province, only forty minutes away from the world famous Kruger National Park. 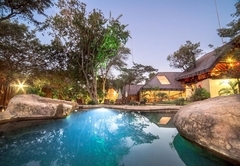 The thatched main building is entwined around a large Marula tree. 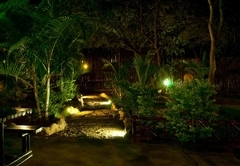 It consists of a lounge, dining area, curio shop and a charming treetop bar. The magnificent rock swimming pool is the perfect place to cool off during hot summer days. From our superb lookout viewpoint you can enjoy a stunning view over the African bush and the northern Drakensberg Mountains. Our knowledgeable rangers will take you interesting morning and late afternoon game drives and reveal many secrets of the African wildlife to you. 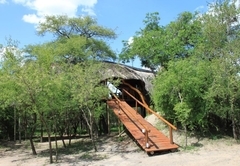 At Pezulu you find an escape from today's hectic world and enjoy the unspoilt African bush. 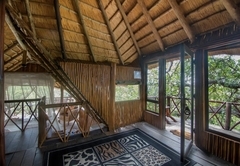 The Lodge comprises of eight unique thatch and reed Tree Houses, accommodating a maximum of 22 people. Each unit has been built to blend with the environment whilst maintaining an element of luxury. 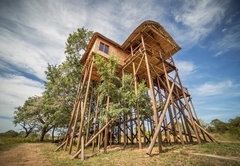 No nails have been knocked into the trees, rather the units have been built around the trees, resulting in huge branches which are still growing, passing through the Tree Houses. 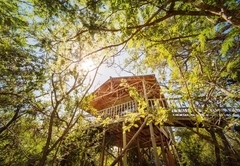 The Tree houses are ecologically friendly with nothing but wood used in their construction. Every unit is en-suite, most of them with an open-air shower. 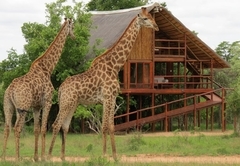 From your private balcony you can view herds of animals passing below, or view a giraffe eye to eye. We have a beautiful honeymoon suite. 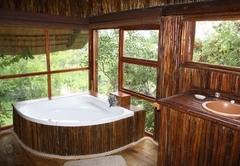 It is built on two levels; it has a king size bed, a sitting area, a bathroom and a sunken bath with a view on the bush. You can chill out in the hanging chairs on the balcony overlooking the Drakensberg Mountains and a waterhole where animals come to drink. 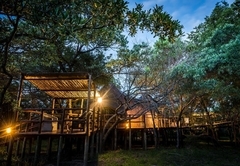 Don’t miss the opportunity to stay in our fabulous dream tree house. 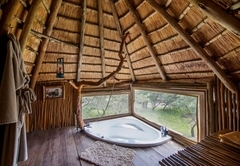 It is built on two Marula trees and consists of a very spacious main bedroom, a cosy lounge as well as a beautifully decorated bathroom with a Jacuzzi bath. Furthermore a separate walkway leads to the fantastic twin outdoor shower. The four poster king size bed is built on wheels, allowing guests to sleep either inside or outside on the balcony under the stars. 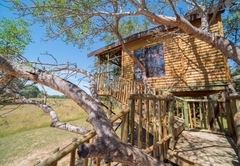 From the large balcony you will enjoy the most amazing view over an African savannah as well as a waterhole. 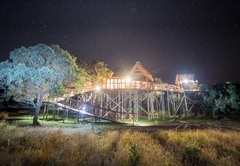 The 7-metre high Mountain View tree house is built in a majestic Jackalberry tree and consists of a spacious bedroom, a king-size bed and a separate bathroom with a Jacuzzi bath. Just around the corner you reach another outside bathroom with an outstanding outdoor shower surrounded by the leaves and branches. 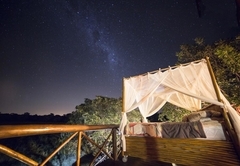 From your balcony you have the most stunning panoramic view over the northern Drakensberg Mountains allowing you to chill out in comfortable couches and enjoy a romantic sunset. 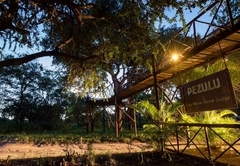 Pezulu has three family units which are able to accommodate a family with up to four children. The bedrooms are on the same level, they are only separated by a balcony. We can also put one or two beds in the parent’s bedroom for very young children who don’t want to sleep alone. Children love our tree houses. Our cuisine is traditional South African. 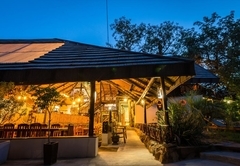 Dinner is served under the stars in our beautiful outdoor boma. Around the fireplace you can sit back with a nice glass of wine and reflect on the day passed whilst listening to the surrounding sounds of the nocturnal African bush. Our experienced rangers will take you on morning and late afternoon games drives and share their extensive knowledge of the bush with you. 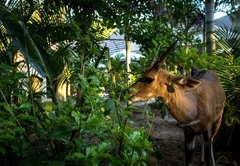 You will not only get close to the animals but also learn a lot about trees and plants. On the morning game drive we stop in the heart of the bush for tea, coffee and rusks. During our late afternoon game drive we stop for a romantic sundowner and enjoy the sunset behind the stunning Drakensberg mountains. On the way back, our tracker will try to view nocturnal animals with a spot light. 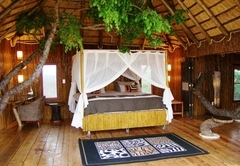 Jackalberry Standard Tree House - Consists of one bedroom which sleeps a total of 3 guests in 1 Double and 1 Single bed. 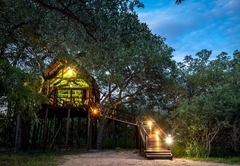 This beautiful tree house is built on two levels; it has a king size bed, a sitting area, a bathroom and a sunken bath with a view on the bush. 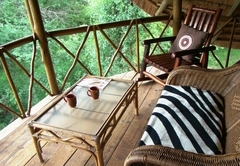 You can chill out in the hanging chairs on the balcony overlooking a waterhole where animals come to drink. 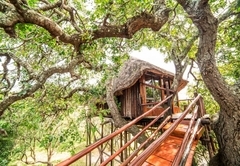 This tree house accommodates two people but there is space for 1or 2 extra single beds or Bunk bed if a family of 4 wants to book this particular treehouse. 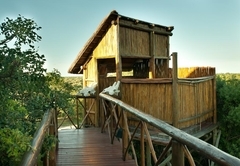 This is the highest tree house with a great view of the mountains which also has a Jacuzzi. 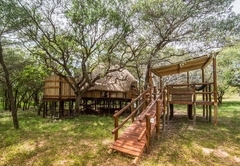 This tree house can accommodate a family of 6 but should a family of 7 want to book this particular tree house we can add an extra single bed. Consists of two bedrooms which sleeps a total of 5 Pax. The one bedroom has 1 DBL bed and the other bedroom has 3 SGL beds. These bedrooms share an inside bathroom with a corner bathtub. There's also an outside shower with toilet facilities available. 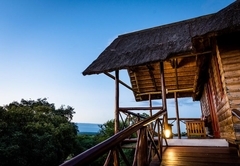 Luxurious Dream Tree House is built on two Marula trees and consists of a very spacious main bedroom, a cosy lounge as well as a beautifully decorated bathroom with a Jacuzzi bath. Furthermore a separate walkway leads to the outdoor shower. 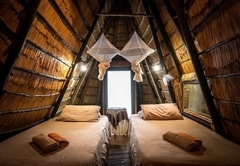 Consists of one bedroom which sleeps a total of 5 Pax. 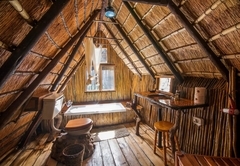 (1 double bed and 3 single beds) This tree house has one bathroom only with a shower and toilet facilities. We had a fabulous time a Pezula Tre House! The positive reviews are either out-of-date or lies. Nothing was good or even okay. It's a complete ripoff. I would have taken the financial loss and not gone if I had known what it was like -- worse than you could imagine. 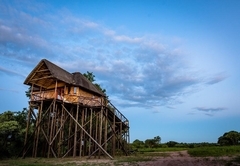 Response timePezulu Tree House Lodge typically responds to requests in 5-10 minutes.